With the recent addition of student yearbooks from Lees-McRae College, we are very pleased to announce the North Carolina Digital Heritage Center has now worked with 100 different institutions. These 100 content partners have contributed an incredible variety of materials related to the history and culture of North Carolina, all of which is easily and freely accessible at DigitalNC.org. Our partners are spread across the state, from Western Carolina University and the Haywood County Public Library in the west, to Elizabeth City State University and the Wilmington Railroad Museum in the east. The biggest concentration is in and around the cities in the Piedmont, with eight of our partners located in Guilford County and seven each in Mecklenburg and Forsyth Counties. While we’ve worked with institutions in all parts of the state, we have yet to reach every county. Our partners come from 51 different counties, leaving just under half of the state’s counties yet to be represented. In coming years, we’ll continue to reach out the remaining counties, as well as to organizations of all types and sizes who are interested in working with us on our shared goal of promoting and increasing access to North Carolina’s cultural heritage. Student yearbooks from Lees-McRae College are now available in the North Carolina Yearbooks collection on DigitalNC.org. 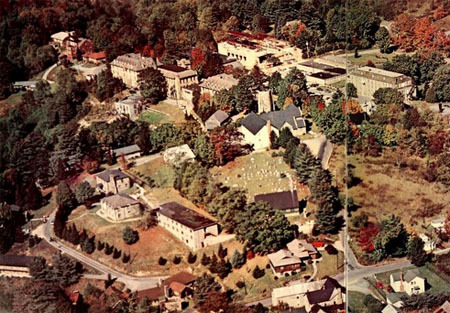 The Lees-McRae “campus in the clouds” is located in Banner Elk, N.C., and is now home to around 900 students. The college traces its origins to 1899, when it began as a boarding school for young women in the area. There are 67 issues of the “Ontaroga” online, ranging in date from 1930 to 2006. According to the first volume, the name “Ontaroga” means “Place of Rocks and Hills,” which the early students saw as a fitting description of their mountain campus. The original volumes of the “Ontaroga” are located in the James H. Carson Library at Lees-McRae College. Over 500 issues of The Pinehurst Outlook, a weekly paper that began publication in 1897, are now available online in the North Carolina Newspapers collection. The Pinehurst Outlook was published by James Tufts in order to promote the village and its activities and to foster a sense of community among visitors. The paper differs from many of the others published during the period in its nearly exclusive focus on local news and events and also for its clean, orderly layout and printing. Readers interested in the history of golf in the United States will be especially interested in the Outlook’s coverage of the development of many of Pinehurst’s most famous courses by designer Donald Ross, as well as coverage of early tournaments. The Highland Messenger was nominated for digitization by the Buncombe County Public Libraries. Historic issues of the Goldsboro Headlight from 1887 to 1903 are now available in the North Carolina Newspapers collection. 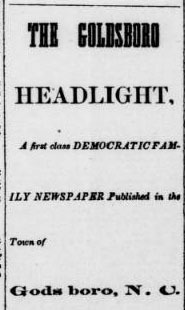 Advertised as a “first class Democratic family newspaper,” the Headlight was published weekly and was typical of the newspapers of the time in that it included a little local news and politics, a regular column reporting on social activities in the town, and a lot of features and illustrations borrowed from other publications around the country. Some of these papers seem more like issues of Reader’s Digest than what we know of newspapers today. In just one issue from January 1891 I found articles on travel in Japan, the use of the letter “J” in Holland, and a story about how stuffed owls are still in fashion. The Goldsboro Headlight was nominated for digitization by Wayne County Public Library.